This summer, Efficiency Canada’s Executive Director, Corey Diamond, published an op-ed titled Why Doug Ford Needs an Energy Efficiency Strategy. Today, I am writing an updated and expanded version in blog form. I will dig into some of the details, and refer to recent statements by Ontario Ministers to show that energy efficiency is a solution to many of the problems the new government has identified it wants to tackle in its mandate. 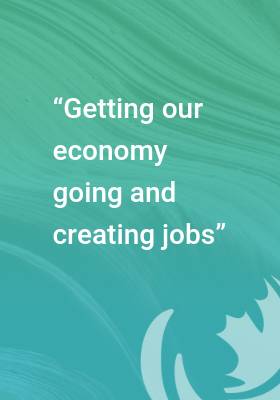 “Getting our economy going and creating jobs” is at the top of this government’s agenda. Improving energy efficiency can create jobs throughout the province. Efficiency Canada’s recent study estimated that achieving deep energy savings, similar to leading New England states, would create an extra 57,000 annual jobs in Ontario, on average, between now and 2030. Efficiency programs directly create jobs in important sectors like construction and manufacturing, and it puts more money in people’s pockets which is re-spent in local economies. Improving efficiency also contributes to a more competitive business climate. If businesses spend less on energy they free up dollars to invest in more productive capital improvements and human resources. Efficiency improvements also boost labour productivity because better designed buildings increase employee satisfaction, reduce sick days, and improve worker health and safety. There are numerous examples of CEOs realizing that the return on investment from efficiency is much broader than originally thought because of factors such as reduced maintenance, more employee engagement, and more retail sales. The Progressive Conservatives aim to help Ontario consumers cut their energy bills and help “the little guy”. A benefit of energy efficiency programs, is that they can be targeted to those most in need. Everyone in the province does not have the same energy bill, and those bills place a higher burden on particular households. For instance, a 2016 study by the Financial Accountability Office of Ontario showed that residents in Northern Ontario spend more on energy than those in Toronto-Hamilton-Niagara (figure 1). This is largely because northerners use more electricity and fuel oil to heat their homes. Efficiency programs can target these specific houses for upgrades to building envelopes and heating systems. Lower income individuals also face a larger energy burden. Ontarians with incomes less than $31,691 spend 6% of their income on energy while those making over $126,123 spend 2% of their income. Energy efficiency programs can target households with higher energy burdens, and cut their energy use by 25%. This would make a noticeable difference to those consumers most concerned about energy costs, in a way that indiscriminate price reductions cannot. In a recent statement, the Ontario Energy Minister, Greg Rickford, stated that he was going to “stop approvals for wasteful energy projects where the need for electricity has not been demonstrated”. While this statement was made in the context of renewable energy sources (which have contributed to electricity system needs and coal phase-out), the same words are often spoken by efficiency advocates. This is because many electricity generation and infrastructure projects would not be needed with more aggressive energy conservation. In fact, when we compare the extra costs associated with improving energy efficiency with generation, energy efficiency is typically the lowest cost option. Figure 2 provides the costs comparison for Ontario. In 2016, it only cost 2.2 cents for Ontario’s conservation programs to save a kilowatt-hour. Conservation program costs could be as high as 5 cents/kwh. 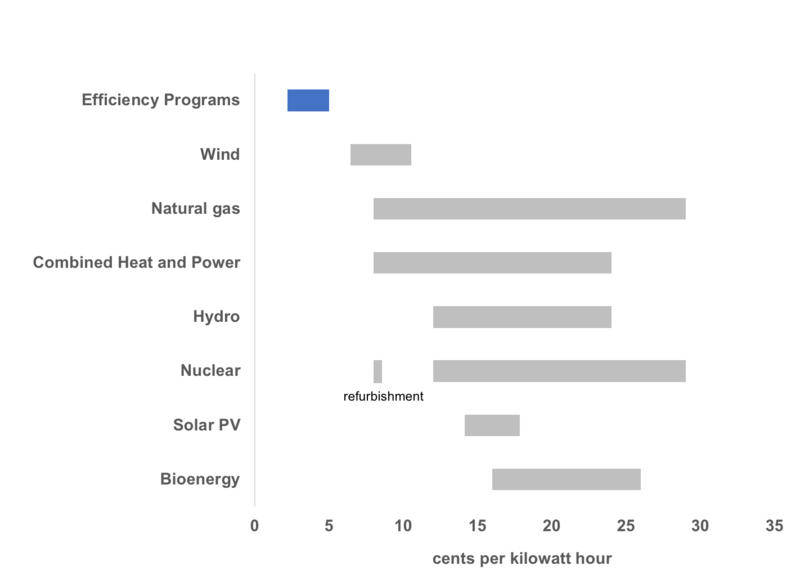 We can compare this range of efficiency costs to the natural gas range of 8-29 cents/kwh, and the estimated cost of nuclear refurbishment quoted at 8 cents/kwh with a major risk this cost will be much higher. Efficiency is also lower cost than renewables. Ontario’s 2016 large-scale procurements provided an average price of 8.6 cents/kwh for wind and 15.7 cents/kwh for solar. Ontario is currently experiencing a bulk electricity surplus, so it might seem that new generation plants are not on the horizon. However, Ontario nuclear fleet is ageing, with plants that need to be retired or refurbished. The plants will need to shut down for refurbishment which will require new gas plants or energy imports, and associated transmission lines. These generation sources will create unnecessary costs and political controversies over local siting decision. They are best avoided with cheaper and cleaner energy conservation. To ensure Ontario has the lowest cost electricity system energy savings efforts must be continued and expanded. The savings measures implemented today will last for the next decade, and the annual savings will accumulate to a scale that avoids unnecessary generation costs. Sources: Environmental Commissioner of Ontario 2018 Conservation Report, p. 138, IESO 2016 Large Renewable Procurement & Molina 2014. The new government has also noted that about 26% of the electricity generated from wind and solar was curtailed in 2017. To manage the electricity system the system operator can ramp up or down generation sources. Because Ontario’s “baseload” nuclear plants are quite inflexible, renewables are often scheduled to come offline to match supply with demand, which means Ontarians might not benefit from electricity that could be generated when the wind is blowing or the sun is shining. To remedy this lost opportunity, Ontario’s electricity system requires more “flexibility” to match demand with supply. Instead of ramping up and down generation, it is also possible to ramp energy demand down and up. For instance, a well-insulated hot water tank can be heated when the wind is blowing and store the heat until it is required. A home can be heated or cooled when there is surplus electricity. If the home is well insulated it will hold that energy like a battery. These “demand flexibility” initiatives control costs and improve the efficiency of the electricity system without affecting customer comfort. It would mean electricity grid operators pay electricity customers to manage their demand. 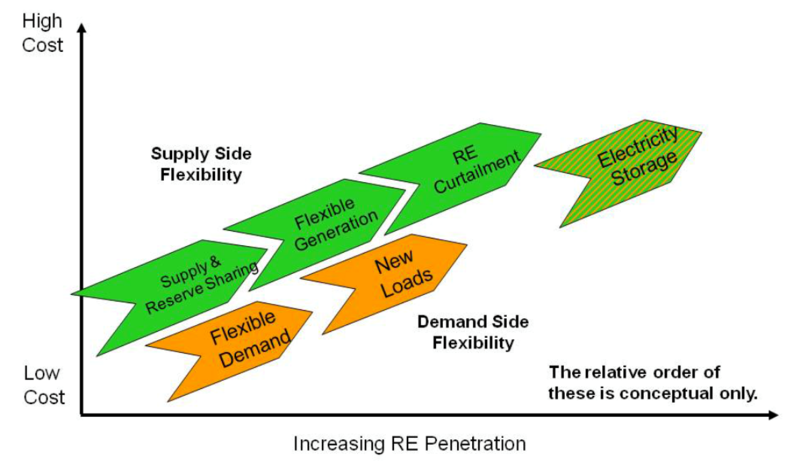 The demand side could give the electricity grid the flexibility it needs at much lower cost than renewable energy curtailments or other supply side options, as is conceptualized in figure 3 from the US National Renewable Energy Laboratory. Directing conservation programs to provide energy savings and “flexibility services” would increase the value of existing renewable energy resources and improve the overall efficiency of the electricity system. The Minister of Environment, Conservation, and Parks, Rod Philipps, announced that his government would introduce a new plan to address climate change. The Minister noted that he is seeking low-cost ways to reduce GHGs, and that provincial and federal governments should focus on making meaningful reductions in GHG emissions, using multiple policy instruments. Energy efficiency should be a major component of any climate plan because it achieves GHG reductions at low cost, and is a large part of the solution. Energy efficiency could help meet 25-39% of Canada’s 2030 GHG reduction commitment under the Paris Accord, and 30-40% of reduction required to reduce emissions 80% below 2005 level by 2050. Efficiency can also achieve reductions at low cost. This is demonstrated, on a global level, by the McKinsey abatement cost curve in figure 4. 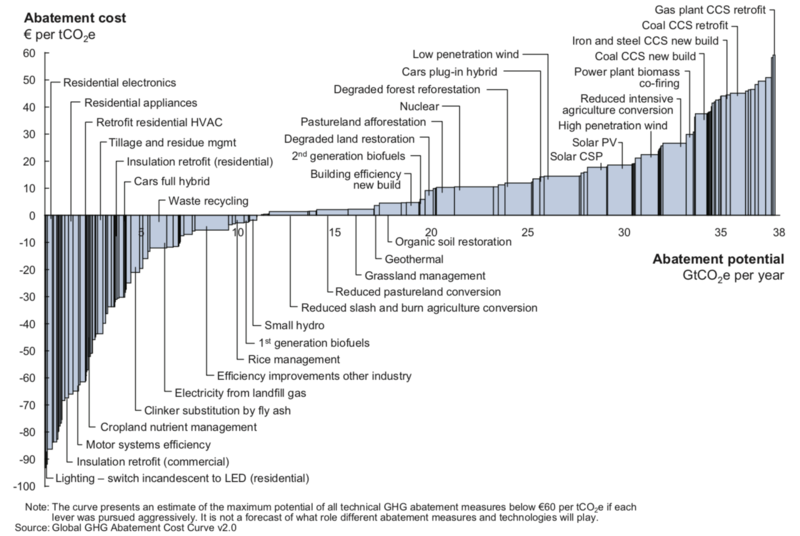 The curve orders different GHG reduction options from lowest cost to higher cost, from a societal perspective. There are many energy efficiency measures – such as improvements to residential appliances; heating, ventilation and air conditioning (HVAC), and insulation – that have negative costs, or net benefits from a societal perspective. As the Ontario government develops its new climate plan, it should consider energy efficiency as a core plank. The new Ontario government can take advantage of energy efficiency for all the reasons noted above – more jobs, improved competitiveness, lower energy bills, avoiding unneeded energy generation costs, increasing the value of existing renewable energy generation, and reducing GHG emissions. The new government might also wish to emphasize different approaches. For instance, objectives related to reducing household energy burdens and improving businesses competitiveness could be added to energy savings performance metrics. Programs could also focus on achieving long-term energy savings by preparing markets to adopt more energy efficiency designs and technologies. Efficiency strategies could also aim to crowd in private finance and work to develop a robust competitive market for energy efficiency products and services. Achieving these objectives will require an improvement and expansion of existing efforts. It will be important to ensure efficiency, conservation, and demand flexibility are integrated into energy system planning so they compete against more expensive supply side options. Programs should also be professionally delivered, and administrators should be both held accountable for results and given the operational flexibility needed to serve energy consumers most effectively. There are numerous reasons why energy efficiency corresponds with what the new Ontario government is aiming to achieve. The next step is to develop an approach that lets efficiency demonstrate its value, and learns from existing from best practices.